A classic with real cult potential. STABILO point 88 - loved by so many! The instantly recognizable STABILO point 88 fineliner is a timeless classic, with over 3 billion pieces sold and loved by so many all over the world. No matter whether you wish to structure your texts, underline, take notes or write full texts, our wide range of 47 brilliant colors, including 6 neon shades will have you covered. An 0.4mm line width and excellent quality make this a product you can rely on and enjoy using every day. The STABILO point 88 is the perfect companion for schoolchildren, students and professionals. First released in 1977, this product is appreciated around the globe for its quality and usability. In Europe it’s the most popular fineliner available. The famous hexagonal body shape of the STABILO point 88 makes it very comfortable to grip. A choice of 47 colors means there will always be the ideal shade for your needs. If you wish to create a bigger impact, 6 neon colors available. Thanks to the long cap-off time you won’t have to worry if you accidentally leave it off. Everyone has their own personal style. Don’t just show it on paper, show it with your pens! The new Individual. Just like you edition is taking design to a whole new level. The combination of design and algorithm guarantees that every wallet and rollerset is unique. It’s not only varied on the outside, but also on the inside: the wallet comes with 15 and the rollerset with 30 premium fineliners in different colors, including five brilliant neon shades each – to add a splash of color to your day! The rollerset is the perfect solution for bringing more organisation and individuality to the premium STABILO point 88 fineliner. The wallet and rollerset is not only perfect for school, college, office and on the go – it’s also an ideal gift. The 0.4mm line width offers you a great deal of control and precision and the metal-enclosed tip provides strength and durability. For drawing you can create intricate details; for writing you can go really small with your font size. It is also perfect for use with rulers and stencils, making it ideal for precise work, structuring texts and taking notes. Add some color to your life! STABILO point 88 comes in 47 colors. Here are some of the most favorite ones! STABILO is committed to the responsible use of natural resources. Our aim is to minimise environmental pollution by using state-of-the-art technology and materials. As a member of SOFEA, a non-for-profit European association that encourages sustainability in the European industry for office supplies, STABILO supports the aim to make product data more transparent so that end-users are able to make well-considered and sustainable purchasing decisions. STABILO point 88 individual pen is rated with the mark B – excellent level. Products with this rating have high level of overall sustainability performance. This typically reflects product environmental features above the market average, often together with limited impacts in manufacturing and commitment in company management. The STABILO point 88 wallets have a C-level score that stands for a plus level of sustainability. Products of this category have an average overall sustainability performance, commonly reflecting standard products features, often combined with average practices in manufacturing and company management. 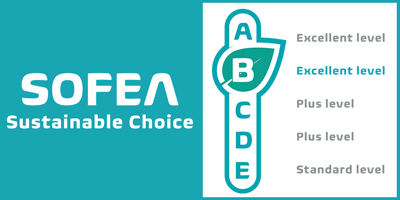 Click here for more information about SOFEA and the rating system. PDF Download of the SOFEA scorecard for STABILO point 88 single pens. PDF Download of the SOFEA scorecard for STABILO point 88 wallets.